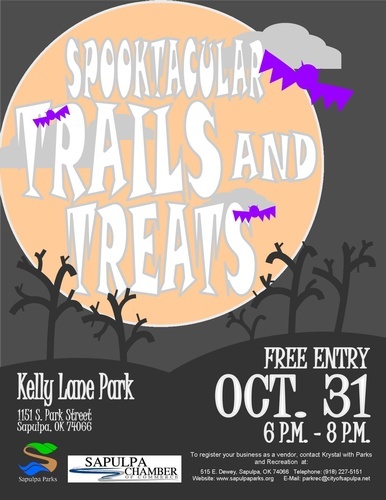 Sapulpa Parks & Recreation and Sapulpa Chamber of Commerce are joining forces to host this first ever trick or treating event at Kelly Lane Park. Local merchants and organizations will be set up on the trails of the park, games and much more will make the evening a family friendly event. Bring your little ones to Kelly Lane Park for all the fun. Kelly Lane Park is located on Taft, near the intersection of Taft and Main. Halloween, Oct 31, from 6 to 8 p.m.